Carapace is up to 2.5 cm long and 6 cm wide. Dorsal surface of carapace finely granular (almost smooth to the naked eye), antero-lateral margins 4 obtuse teeth. Small median notch between eyes. Chelipeds equal in size, large and heavy, black-tipped and without spines or tubercles. Walking legs stout and relatively short. Yellowish or reddish-brown, occ with patches of darker brown. 2nd to 4th pairs of antero-lateral lobes separated from each other by inwardly directed, very broad and shallow depression. Postero-lateral margins of carapace setose. 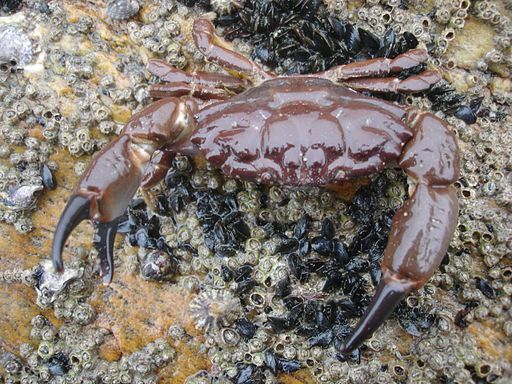 Habitat Occurs from the lower shore down to depths of up to 40 m, often on stony substrata.